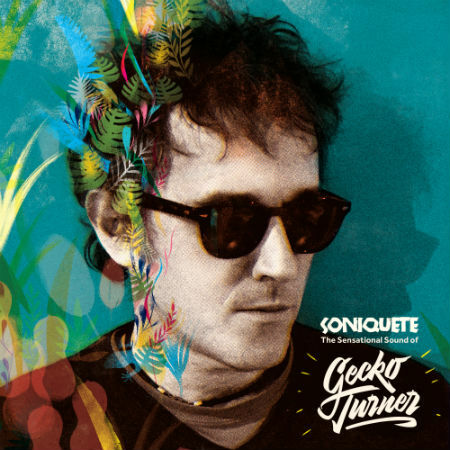 “Soniquete: The Sensational Sound Of Gecko Turner” features 13 classic cuts selected from his previous four long-players on Spanish label Lovemonk, plus a brand new track. The record includes heavyweight guests like the mighty UK vocalist Eska, Brazilian and flamenco percussionist Rubem Dantas and Cuban pianist Javier ‘Caramelo’ Masso. Gecko Turner‘s artistry as vocalist, multi instrumentalist and arranger shines through a global melange of styles from West African disco to hot-stepping Caribbean descargas. There are sounds and textures of all persuasions – mini-moog, clavinet and mbira sit alongside the cajon and other Latin and Brazilian percussions, yet it’s the use of Gecko’s language that truly sets his songs apart; the way he twists words and sentences so they become one with the melodies. Singing in English, Spanish and a tongue only Gecko is privvy to, where local slang, foreign lingo and ‘made up’ words poetically combine, his songs always come with a nudge and a wink. The way he records, writes, composes and produces everything results in something he calls “soniquete”, a word often used in flamenco to refer to the rhythm and sound. A case in point is the debut single and signature Gecko tune “Un Limón En La Cabeza”, originally released in 2003. “Soniquete” is a snapshot of an artist who lives, works and plays with wild abandon, caring little for music industry norms or the big city, much preferring his Extremadura outpost by the Guadiana river. With a life philosophy learned from his experiences ‘on the road’, he absorbs jazz, global music and literature. With the help of a guitar or a piano, blistering sunshine, a wee dram and a puff of smoke, Gecko is an expert at turning inspiration into expression, clever word play and writing incredibly addictive songs. The album release coincides with the vinyl represses of his previous albums “Guapapasea!” (2003) and “Chandalismo Ilustrado” (2006).